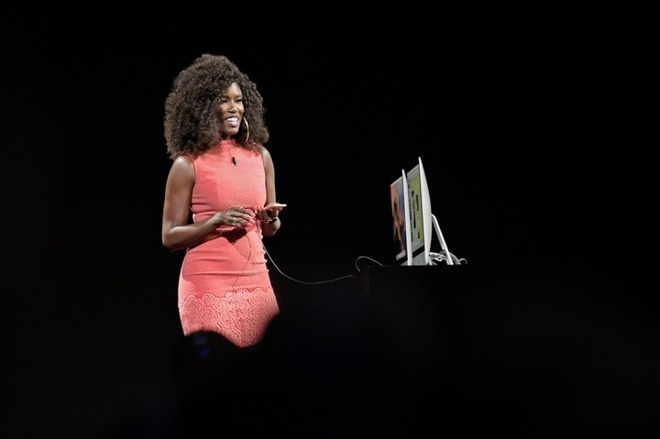 A "power lunch" with the chief of global consumer marketing for Apple Music and iTunes Bozoma Saint John is up for auction, with the proceeds benefitting the Rush Philanthropic Arts Foundation. The auction posted on CharityBuzz has a starting bid of $1500, and an estimated value of $10,000. Bozoma "Boz" Saint John joined Apple as part of the Beats Music acquisition. Her Apple debut was at this year's WWDC keynote speech, showing off the new features of Apple music coming in iOS 10 and MacOS Sierra. Previously, Saint John served as vice president of marketing for fashion brand Ashley Stewart, as well as at Spike Lee's advertising agency SpikeDDB. The Rush Philanthropic Arts Foundation, founded by Def Jam Records founder Russell Summons, Run-DMC member Joseph Simmons, and Danny Simmons aims to provide inner city youth across New York City exposure to the arts, as well as providing exhibition opportunities to new artists. Apple executives Tim Cook and Eddy Cue have also offered auctions for charity on the CharityBuzz service. Cook's latest offering on CharityBuzz gathered $515,000 for the Robert F. Kennedy Center for Justice & Human Rights. No bids have been made on the luncheon as of yet. The auction runs through July 21.